Recently released raw footage shows Portuguese big wave surfer and airline pilot, Salvador Villas Boas (51 ys old) charging one of the biggest waves of the day on the first peak at Nazaré during a monster swell in February 2019. Salvador rides the wave until a bump makes him fall of his board on the most dangerous zone of Praia do Norte near the rocks and impact zone. The wipeout was gruesome, with Salvador hitting the water at nearly 50mph, the whole scene resembled a car accident and in a few seconds after first impact, Salvador is pulled back over the falls and hits the water a second time, suffering an extensive hold down period before finally resurfacing. The moments that followed the wipeout were a matter of life and dead, this wave was not the last wave of the Set, there was more to come and Salvador’s position on impact zone and near the rocks demanded immediate rescue. 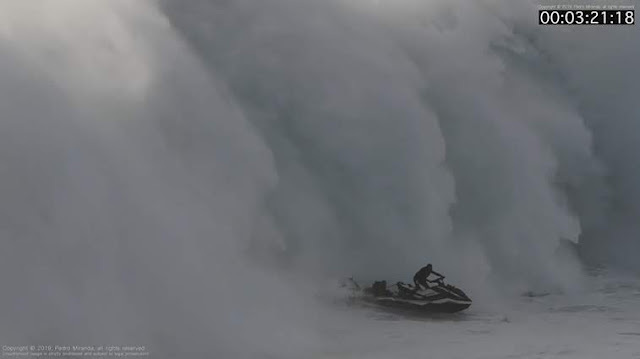 This is when Ramon Laureano, a Portuguese-Brazilian professional Jetski Rescuer comes into play, he had been following Salvador from behind the wave, and knew the situation demanded a rescue on first attempt. In normal circumstances, this rescue would’ve been made after a second wave, but Ramon knew the potential implications of Salvador getting caught in the impact zone, and attempted the rescue anyway in the short window of opportunity he got. He successfully picks up Salvador at the very last second, and speeds up away from the area, while avoiding being swallowed by the giant wall of white water. This ended up happening a few moments later with his Jetski being capsized by white water, but on a very different area of Praia do Norte, away from the rocks and much closer to the beach. Both Salvador and Ramon were able to swim back safely to the beach, where the jetski was already “parked”. No injuries reported in what was one of the most spectacular rescue operations of this season in Nazaré. Pedro Miranda, the filmmaker who captured this footage added: “This rescue in particular was truly one of the most heroic moments I witnessed out there” (…) “with more than 20 years of big wave experience, Ramon performed one of the most difficult rescues one can attempt in Nazaré” (…) “to pickup someone directly on the first peak’s impact zone between set waves, is something you don’t see everyday here. Ramon was a real hero, no doubt!" Ramon Laureano (46 ys) is a Portuguese-Brazilian Professional Jetski Rescuer with more than 20 years of Big Wave surfing experience, he runs “Jet Resgate Portugal” which provides rescue and tow-in services for big wave surfers, along with educational courses in rescue and safety. Salvador Villas Boas (51 ys) is an experienced veteran surfer and a commercial airline pilot, currently active in the Nazaré big wave scene, as part of his passion for big wave surfing.